Benny’s Notebook: It’s finally here — whew. This is our last set of mocks and mine is mostly the same over the first 30 picks. One week after dropping Luka Dončić down, I’m moving him back up to No. 2 with Sacramento. Obviously, Marvin Bagley III appears to be the popular favorite here, but Dončić has just continued to impress during his never-ending season with Real Madrid. Truthfully, the Kings can’t really go wrong here — but Dončić is the type of do-it-all prospect that the franchise could really use moving forward. For now, the jury is out on Willie Cauley-Stein, Buddy Hield, and Skal Labissiere but pairing Dončić with De’Aaron Fox feels incredibly shrewd. Elsewhere, Jerome Robinson has been a late riser and will head into the draft night as a hot topic. The Hawks own three first round picks and walking away with Bagley, Robinson, and Grayson Allen would be a no-doubt success. They’ll have plenty of intriguing options in each slot, so watching how they mix-and-match their selections by position and current roster talent may be one of the draft’s most interesting narratives. Another team with picks to shuffle around are the Brooklyn Nets — current holders of No. 29, No. 40 and No. 45. While reports have indicated that the Nets would like to move up, it’s tough to see them giving up any future picks after finally leaving the Billy King era behind. Some combination of those picks could see them snag a higher selection, but nominally at best. No matter what picks they end up with, look for general manager Sean Marks to swing for the fences as usual. Ultimately, a full 60-pick mock will come with some second-round guesswork — but I feel confident about those names included here. As I mentioned last weekend, international players will almost certainly get selected, and I’ve included five of them here: Rodions Kurucs, Isaac Bonga, Issuf Sanon, Arnoldas Kulboka and Tryggvi Hlinason. Embrace the overseas journey! Aside from that drama right at the top of the draft, we’ve known for several weeks that the Knicks covet Michael Porter, Jr., and I’ve been led to believe that he and Kevin Knox are the two prospects most likely to wind up as Knicks with Collin Sexton sitting at third on the depth chart. What’s important to understand about the pre-draft process and the mock drafts that we do is that the entire monthlong process between the Combine and the draft is a period of discovery where teams (as well as us) are consistently getting new information that changes our predictions. And at the end of the day, that’s all these are—predictions. So while we do have a high degree of certainty with respect to which prospects are coveted by which team, one player being drafted much higher than initially thought (keep an eye on Kevin Huerter and Wendell Carter, each of whom have lottery-busting potential) or one slipping (I’ve heard that Trae Young or Michael Porter could fall to the backend of the lottery) could literally change everything. At the end of the day, the Clippers are going to walk away with a player that would have gone top 10 in a lesser-talented class. Aaron Holiday, Keita Bates-Diop and Moritz Wagner are the mid-to-late first rounders that I think will have fruitless careers. It all ends tomorrow night, and I can’t wait. Jesse’s Notebook: The 2018 NBA Draft is almost here! We enter the draft with a lot of open questions and some uncertainty. As of yesterday, the Atlanta Hawks are now leaning toward drafting Luka Dončić if he is still on the board at No. 3. Some reports suggest that Michael Porter Jr. has a generally good medical outlook, though that does not seem to be a consensus opinion. Porter Jr. is in play to go No. 2 overall but also could slip a bit as well. I still have the sense that big trades could throw off the projections and create significant chaos. I am keeping an eye on the Los Angeles Clippers, who have the 12th and 13th overall picks. They could try to trade up for a top prospect (they have been linked to Luka Dončić in some reporting), but could ultimately stand pat. The Clippers should be positioned to add two talented players that can bring added youth and talent to positions of need. The Kawhi Leonard situation continues to be a factor that certain teams have to consider in every move they make. Leonard reportedly met with Gregg Popovich last night and seemingly has not changed his insistence in being dealt out of San Antonio. It’s not clear this will have any impact on how teams go about their business on draft night, but it’s something to keep in mind. Steve’s Notebook: With draft day upon us, there seem to be some answers at the top of the draft board, and a lot more questions in the middle, so let’s start with the top overall pick to the Phoenix Suns. Sources close to the process said last night that the overwhelming belief is the Suns will draft DeAndre Ayton number one. This isn’t a huge shock, but it seems it would take something earth-shattering for him not to be the top pick. The Sacramento Kings at number two are still a little bit of wild card; the word is that several members of the Kings front office believe strongly that Michael Porter Jr will be an elite player in the NBA and that while he has questions surrounding his back, its worth the risk. It’s unclear if that will win out in the room, but Porter Jr is still firmly in the mix in Sacramento at number two. The conventional wisdom says the Kings will pass on the risk, which puts their next guy on the board in Marvin Bagley III in a Kings draft hat on Thursday. The Atlanta Hawks seem to be tipping their hand that Euro sensation Luka Dončić is moving into the top spot on their draft board with the Hawks having done some aggressive background on Luka recently and may be ready to take him number three overall. The Hawks are said to be equally high on Bagley and Michigan State big man Jaren Jackson Jr. The Hawks seem to have moved off Trae Young despite weeks of signals that he was their guy. The Hawks are still considered a team to watch in trade down situations, but it’s looking more likely they will use the third pick, and Dončić could be their guy if Bagley is off the board at number two. The fourth pick is said to be very much in play with the Grizzlies continuing to explore deals to shed contract money (Chandler Parsons) and picking up rookie scale talent or picks later in the draft. The Grizzlies struggled to get top level players to come in for visits and workouts, and many believe they’d rather trade down than draft a player that may not want to be there. If the Grizzlies keep the pick, the belief is it will be Jackson, although his camp has reportedly refused to provide medical information to the Grizzlies and that’s a huge red flag. The Dallas Mavericks at five have a few options with both Wendell Carter Jr. and Mo Bamba being the likely targets. There is a scenario in which Dallas grabs not only the Grizzlies pick at four but retains their own pick at five and takes on Parson who they have a history with. The Mavericks have explored deals all over the place to leverage their existing cap room to obtain talent and assets. The Orlando Magic at six seem to be all over the place; there were reports that the Magic may have Collin Sexton higher on their board than fan favorite Trae Young, which would line up with commentary that started around the team in early April. The Magic have kept their process somewhat quiet, but there is a real chance the Magic grab Sexton at six if the draft plays out as currently scripted. The Chicago Bulls at seven could catch a lot of interesting options including both Porter and Bamba. The Bulls were the first team to see Porter and their medical staff did the physical that was circulated to teams. While the upside on Porter is very real, there isn’t a sense the Bulls are ready to pull the trigger despite what Bulls fans may want so that it could be an interesting scenario to watch. The Cleveland Cavaliers at eight could find themselves with a lot to choose from. The Cavaliers had a last-minute clandestine workout with Trae Young this week and have been rumored to be very high on Shai Gilgeous-Alexander. If the draft plays out as scripted the Cavs could have their choice of Young, Porter or Bamba and that would be a massive win for the Cavs. On the trade front league source have pegged Orlando, Charlotte, Dallas, and Miami as teams to watch on the trade front, all of them seem to be willing to make big moves if deals present themselves. There were reports last night that the San Antonio Spurs and disgruntled star Kawhi Leonard were able to meet face to face. There still is not a sense that the Spurs will pull the trigger on a trade, expect that to take shape today if they decide to open the phones on Leonard. 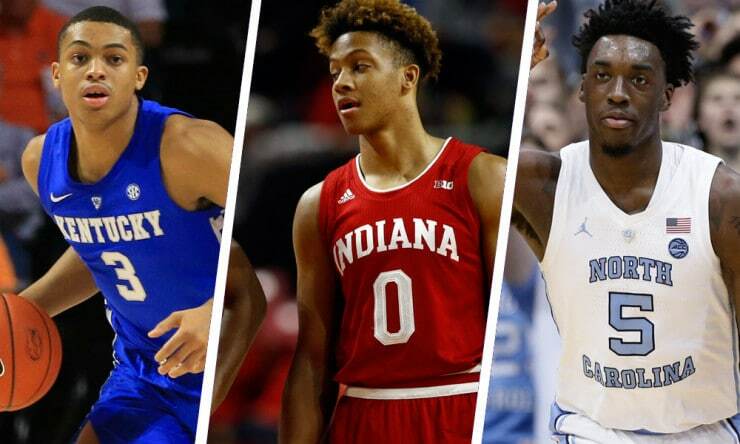 The Basketball Insider NBA Draft Diary is up: http://www.basketballinsiders.com/2018-nba-draft-diary/ – it will have all the latest news, rumors and trades as they are happening, so it you want to see everything going on in one place, bookmark the Diary and hit it early and often. Who are these guys anyway? Steve Kyler is the Publisher of Basketball Insiders and has covered the NBA for the last 19 years. Moke Hamilton is a Deputy Editor and Columnist for Basketball Insiders and has covered basketball for the last eight years. Jesse Blancarte is a Senior NBA Writer and Deputy Editor for Basketball Insiders and has covered the NBA for the last four years. Benny Nadeau is an NBA Writer and has finished his first season covering the NBA for Basketball Insiders.